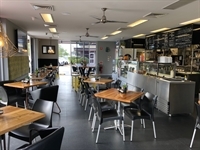 Licensed 5 day Cafe in thriving Business Park on the Central Coast specialising in healthy & organic options. Operating 6am to 4pm Monday to Friday. Seats 52 inside and 32 in mostly covered alfresco. Lifestyle business, plenty of opportunity to expand into catering and delivery if desired. Mostly in house dining and pickup. Current turnover approx. $10,000 per week plus and growing. Turnover: Currently $10,000 per week plus! Brilliant lifestyle business, plenty of opportunity to expand into catering and delivery if desired.